It was a quiet nights drifting for the Iceberg, but fire, speed, ignored ice warnings s[e;t doom for the Titanic? – A salutary business lesson that’s never learnt. 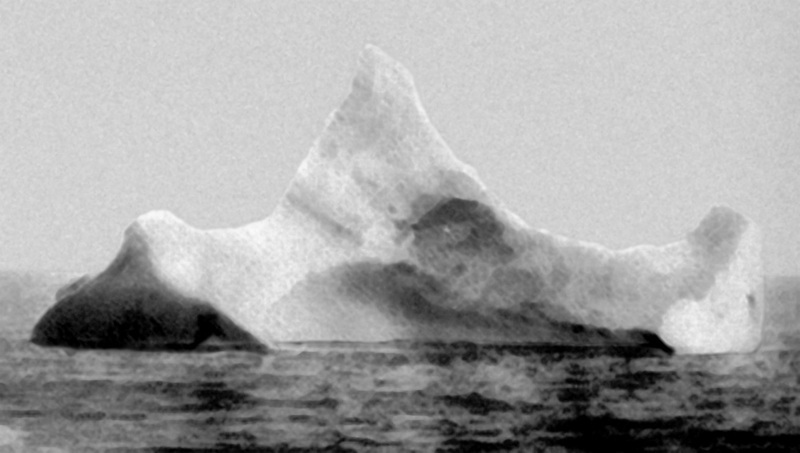 The iceberg thought to have been hit by Titanic, photographed the morning of 15 April 1912 by SS Prinz Adalbert’s chief steward. The iceberg was reported to have a streak of red paint from a ship’s hull along its waterline on one side. As far as the iceberg was concerned it was a small inconvenience but for the Titanic it was a disaster and most businesses think they are the Iceberg in the story but in reality they are more like the Titanic, it’s when” not “if”. The popular story is that the Titanic hit an iceberg because the ship was travelling too fast in an ice field but there were three key factors that conspired that night, everything else just didn’t help. There was a fire on board since the ship left Southampton and it made the steel hull and bulkheads brittle and warped, so if the Titanic had heeded the warnings and not hit the iceberg chances are that it would have completed the maiden voyage but unless corrected there would have been a problem sometime in the future. Fires on coal-fired ships werent unusual. The crucial bulkead allowed the ingress of water to pass through what should have been a water tight bulkhead and tipped the bow lower allowing more water in to pass over the other bulkheads. For the record here are the other points which had an influence. It was traveling too fast, that was because there was a fire and coal would have run short. However, beating the record on a maiden voyage was an advantage. The Bulkheads didn’t extend all the way up to the top of the ship. It didnt make much difference but it could have sunk at a slower rate. There was a confusion with the steering, left used to be right and vice versa but in nautical terms. Capt Smith was known to be reckless, he was involved in several collisions, accidents, fires and grounding, here is a list of ships involved; Olympic, Republic, Majestic, Adriatic, Hawke and Germanic. Mirages and hazy horizons were created by weather conditions which meant it might have been an ice sheet rather than a berg and could have caused all sorts of optical illusions for the lookouts and the nearby ships. The lookouts had no binoculars. They key to the binocular store went ashore with a crew replacement. There weren’t enough lifeboats. Obvious one really, but the crew werent practiced in use or evacuation procedures. The ship was not full, there were 2224 on board, 1115 short of capacity. It’s alleged that the Titanic’s builders tried to cut costs. the rivets that held the ship’s hull together were not the best, uniform in composition or quality and not been inserted in a uniform fashion. Surely, that’s quality control which is again a cost cutting move. If they had travelled backwards towards the Californian 10 /12 miles away for the two hours and forty minutes it took to sink then the distance would have been less but this has been discussed without any conclusions. There was a massive cover up in the UK more than the US. What the hell has it got to do with business? You have to look at the shortcomings and a failure to examine the fundamental lessons that every business should learn. It’s a famous disaster but we, at cmx, come across the same thinking all the time in businesses large and small. No-one wanted to take the blame or responsibility. In any business there should be someone who is the key person and actually responsible, dont chuck the blame or job elsewhere, own it all – it’s a great mind focusser. Maybe the choice of Captain could have been better. Cheapness was a priority. Lack of quality control in construction and keeping the bulkheads shorter than possible. Complacency was rampant. Titanic was unsinkable so bouncing off bergs was possible, it could stop in an impressive 777 yards, who needed precautions? Suspect leadership. A good leader plans, prepares and anticipates difficulties, Captain Smith had a bad track record and was intoxicated, that might be an exaggeration but his track record of hitting things was not good. Who chose him to be in charge anyway? Poor communication. Apart from the radio issues, of which there are many, they had to implement several changes and whether port meant port or porting around. There were two unavoidable facts, the fire and the iceberg, ignoring the radioed ice warning was the what caused the collision. The normal action would have been to stop, as the SS Californian had. Everything else made the loss worse by compounding the problem. So what’s it got to do with computing? Simple, as we have said, we have a saying at cmx “three steps to a disaster”. Although the lessons should be applied to business generally its a good lesson to avoid a computing disaster. Cheapness means continual replacement and unreliability. Spending the right amount gives you reliability, dependability and a more peaceful life. Dont be complacent, train, practice and check. Backups are only of use if they are made regularly, aren’t on the premises and checked they work. Make sure that the people at the top are aware of the dangers and the possibility of the outcomes of losing the business. If they don’t care then move on maybe, they don’t value you or the business. Communicate, talk to your IT supplier and make sure everyone knows what they should and shouldnt be doing. We have alternatives that can make your business secure and safe. The question is how much will it cost if you don’t learn the lessons? In todays terms the Titanic cost $1.66 billion* to build, add in the loss of earnings, the scrap value and over 1,500 lives and it was a total loss. This could be the same thing for your business, the cost, not in terms of lives but a total loss and the ramifications go on long after you’ve lost your data. This entry was posted in Uncategorized on 16th April 2019 by glyncc. Business is good at indecision and it’s certainly fashionable but can you afford to be? The biggest indecision we see is when it comes to IT systems and that is usually caused by complacency. The definition is “a feeling of smug or uncritical satisfaction with oneself or one’s achievements.” That is how data is treated. If a company loses its data it will lose its ability to trade or even function. We have seen it a lot recently as the number of viral attacks and old equipment failures rise. It starts with a simple act, opening the email by mistake, forgetting to make backups, thinking your computer is reliable. If you were to ask any business person what their concerns were on a list of one to ten, data safety would not even come anywhere near but if any of the ten listed were to happen it wouldn’t raise a major worry. The reason for complacency is that the value of data isnt appreciated or understood, its assumed that it will always be there, its existent is relied on like breathing or heartbeats. It’s the “It wont happen to me” reason for forgetting to look after it, and for some reason business people will exercise, eat, sleep, get inoculations and take medicine to keep themselves healthy but wont bother when it comes to their business health. So what should the priorities be? Make sure you have at least 5 copies of your data off site. You’ll notice we havent included keeping your systems up to date, updates cause us more problems than just leaving it all alone and if it isn’t broken…. The important part is keeping your protection up to date. People are religious about “use by dates” for food but have an Anti Virus which updates weekly instead of hourly or is out of licence. See point 1 above on that. we will be investigating the points above in-depth over the next few weeks so sign up to get regular updates. This was written with contributions from the team at CMX, our thanks for all their contributions and time. This entry was posted in security, Uncategorized on 11th April 2019 by glyncc.